In the past, when my quadruplet grandbabies were very young, we had to bypass many little outfits simply because the legs didn’t have snap closures to make diaper changing easier. Well, today’s tutorial that I found made me say “Why didn’t I think of that a few years ago?? ?” (those quadruplet “babies” are now 4 years old). 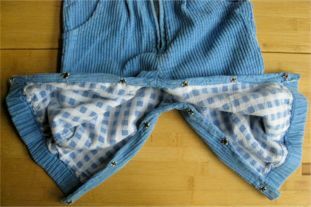 Arwen O’Reilly Griffith at Craftzine Blog has a great tutorial for adding snaps to leg closures on infant / toddlers’ clothing. Thanks for the great tutorial! 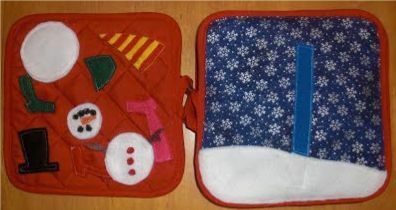 And while we’re on the topic of “remaking”, I found another great tutorial about turning potholders into quiet books. Obsessively Stitching blogspot has a super tutorial on how to make a quiet book from potholders — after all, the potholders are already the right size, quilted and have binding around them — all that’s left is to add the little “fun” things to complete the quiet book. For other ideas and projects for baby items, visit NurseryRoomProjects website and check out the book and free tutorials there.